Shopping for Batman Pop! Vinyl Figures? From the crime-ridden Gotham City of the near future comes Frank Miller's rendition of Robin! From Miller's iconic graphic novel, The Dark Knight Returns, the memorable look is reimagined in Pop! Vinyl format and only available as a Previews Exclusive. 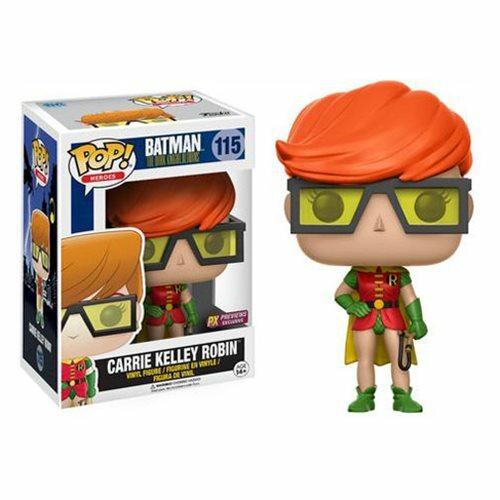 This Batman: The Dark Knight Returns Carrie Kelly Robin Pop! Vinyl Figure measures approximately 3 3/4-inches tall and comes packaged in a sitckered window display box. Ages 14 and up.